Husband/1st child/2nd child: "What's for dinner?" Me: "No idea. But we have garam masala nectarines for dessert." Variations on this exchange are common in our house where I am the primary, though by no means reliable, meal-maker. I can spend hours tinkering with a recipe and produce nothing but a side dish, dessert or even sauce (chimichurri, I'm talking to you). So we're often scrambling (literally or figuratively) for dinner. I guess it's my way of making cooking a more interesting proposition, less drudgerous. I don't really care if everyone in my family is happy with the outcome. That may sound harsh or selfish but honestly, when you're expected to put something on the table five nights a week for four mouths with different taste buds, prejudices and food associations (i.e., stomach flu plus lamb burgers means no more lamb burgers in our house), you're doomed. If you make a killer roast chicken, your occasional vegetarian objects. If you make pasta with vegetables, your carnivore roars. So please yourself, I say, and always have bread and peanut butter on hand. Adding a spicy note to nectarines sounded appealing, so I turned to garam masala, an Indian spice mix that often includes cardamom, cloves, cumin, black pepper, coriander, and ginger. I made a paste with coconut oil (adds a nice tropical flavor but you could use butter instead ), brown sugar, garam masala, nutmeg and oatmeal (for crunch), rubbed it over the cut fruit and roasted them in the oven. I also made it two ways: with and without almonds. I thought one of my daughters might prefer it nut-free, and she did. See? I'm not that selfish. 2. 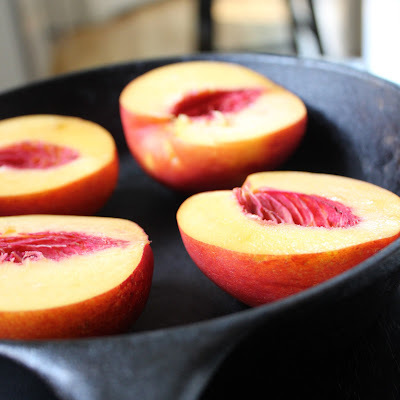 Split nectarines and remove pits. Place in oven proof dish. 3. Combine coconut oil or butter, oatmeal, almonds (if using) and spices by stirring vigorously. Then divide equally (approx. one teaspoon each) on top of peaches. Spread around a bit. 4. Bake for about 25-30 minutes until a sharp knife slides in easily and edges are a little brown. 5. Serve alone or with yogurt, ice cream or whipped cream.